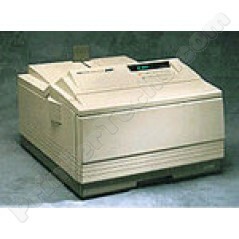 For those who need 11x17 inch printing, this is your printer! The HP LaserJet 4V and 4MV laser printers offer great performance at a reasonable price. High-speed Bi-Tronics parallel port with built-in I/O buffering frees up your computer faster when sending print jobs. Open MIO slot supports HP JetDirect cards for network connectivity options. These printers handle more paper sizes, including 11 x 17, and offers great-looking 600-dpi output with Resolution Enhancement technology. The HP 4V is configured for PC environments, and the HP 4MV is configured for Mac or mixed Mac/PC environments. The HP 4MV also includes an HP JetDirect network card. 12.5" x 18.1" x 20.6"